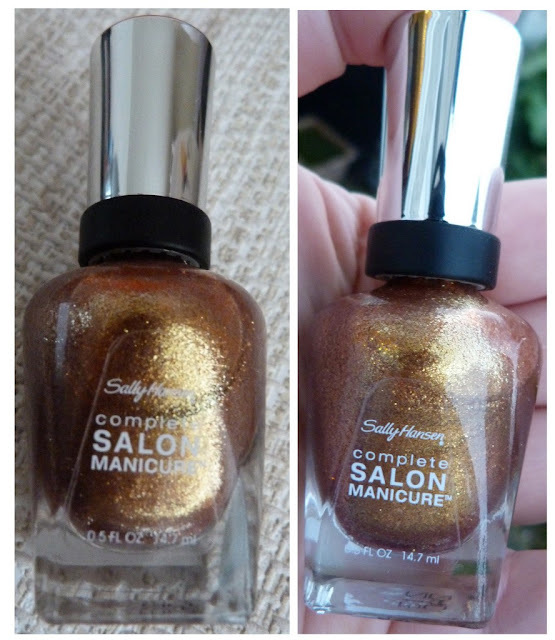 You know you're on to a gorgeous polish when your sister emails you a photo of a polish that's just been delivered. Then an hour later she mails you again to say that she's already painted her nails with it at work. You can't wait for her to get home and she's been warned not to leave it at work by mistake. She comes in the front door and leaving her coat on, you both go outside in what's left of the natural light to get photos of this absolutely breathtaking polish. You then ooh and ahh over it for ages before deciding that you need to have this colour on your own nails, thus having matching nails! 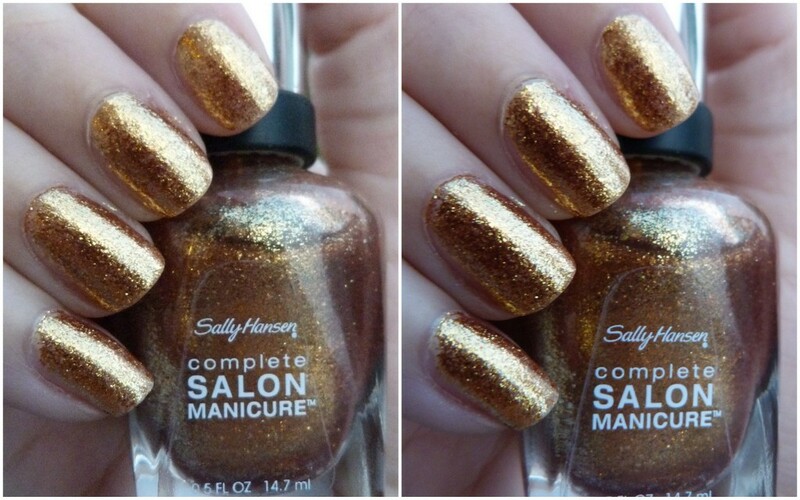 I give you Gilded Lily from Sally Hansen. Designer Prabal Gurung has teamed up with Sally Hansen to create a limited edition collection of four polishes that complement his Autumn/Winter 2012 collection. Gilded Lily is one of those polishes and is by far the most beautiful of the four based on the photos I've seen of the others. Let me show it to you in more detail and I'm sorry for anyone I meet over the coming days as you'll be feasting your eyes on it whether you like it or not! 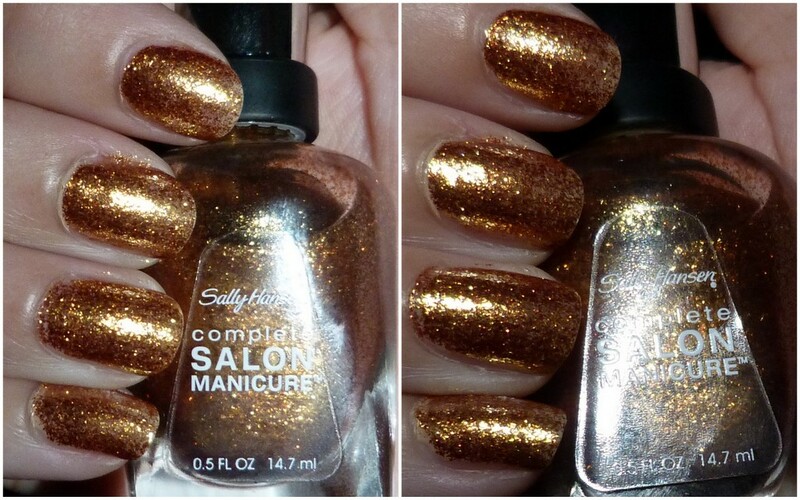 This shimmering warm gold polish has hints of copper, green and brown depending on the light. As I was applying a final coat onto Joanne's nails, we couldn't figure out the finish on it. It's not rough like a regular glitter polish and reminds me of Essie's Shine of the Times top coat, so if you know the name of this finish, let me know! Just look at it. The formulation is thin but easily buildable and what you're seeing is three coats. One coat gives a sheer but deliciously shimmery finish to a nudey nail but come on, you know me now, I can't stop at one coat! Joanne promises me that it's even more stunning in sunlight but until then, on goes the camera flash so I can show you how sparkly it is. I urge you to go check this beauty out. It's €8.95 and available in selected pharmacies, department stores and grocery stores nationwide. If autumn 2012 was a nail polish, this would be it! Oh this is beautiful! I must get my hands on it!!! The formulation kinda reminds me of Model's Own 'Gold Rush'. I'm ashamed to say I've finished off my third bottle of it since I first bought it! Schwiiiing this is gorge! Sally Hansen is quite difficult to get up here, enragingly. That's a total beaut though, will have to go on a hunt for it. omg that is freaking stunning!! !